The small Virginia town of White Post got it's name from a white post with signs pointing to Greenway Court, Battletown (Berryville), Berry’s Ferry, and Stephen’s City. The post itself has been replaced over the years and the main road has moved slightly to present-day Route 340. "This post was originally placed here by George Washington under the direction of Lord Fairfax. 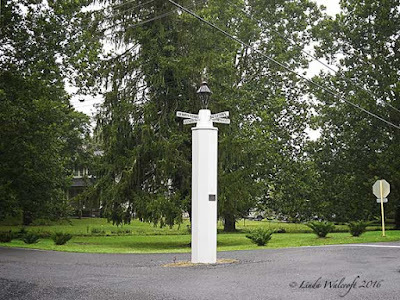 It was erected in 1750 as a guidepost to direct strangers and travelers on the Old Dutch Wagon Road to Greenway Court, the home of Lord Fairfax." Lord Fairfax (the 6th) was proprietor of a huge land grant in Virginia. He lived from 1693 to 1781. His residence is long gone but his name lives on in many place names in Virginia. You may have heard of him as the man who hired a young surveyor named George Washington to map his lands. These guide posts were very common in the day. Thanks Linda for stopping by, I hope to see you again soon. You wonder how many times the sign's been collided with, given that it appears to be in the roadway. I know it was dented one time that I rode by. I imagine it has been repaired numerous times. Wonderful bit of history...so glad you "POST"ed this! That post has an interesting bit of history to go along with it.